Fast forward to 2001. This is my homage to the great Lady the month after 9/11. I thought it was appropriate and I think everyone at work appreciated it. Ingredients: One giant gray-green cut of fabric (on sale, score! 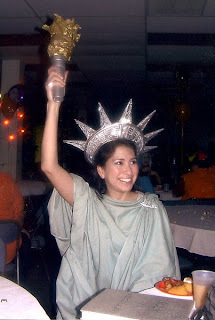 ), one text book covered in silver wrapping paper, one spray-painted flashlight with gold tissue paper flame, one foil brooch, one store-bought Lady Liberty headpiece, a pair of sandals and some silver lipstick. Wow...7th grade! Brings back memories. You looked really cute!